You can't blame Doug Mayman and his fellow crew members of a British Cruiser tank for wanting to keep out of the way of enemy German Tiger tanks in World War II. A shot from a Tiger's 88mm gun could penetrate the front armor of a Cruiser 2,000 metres away, but a Cruiser's 57mm gun couldn't penetrate the front armor of a Tiger one metre away. (This fact has been revealed only recently. Was it known in 1944?). Mayman, a member of the tank regiment, the 15th /19th King's Royal Hussars, kept secret wartime diaries recounting his Army life from November 5, 1943 until his return home from Germany on leave on April 21, 1945. The diaries, already published as a book, Led Soldiers, are now being posted day by day as a blog on the Internet, to the delight of exservicemen - not all of them Brits - and military historians around the world. These diaries provide a living account of Mayman's conscription, induction and training, leading up to his experiences under fire as his regiment fought its way through France, Belgium, Holland and into Germany. 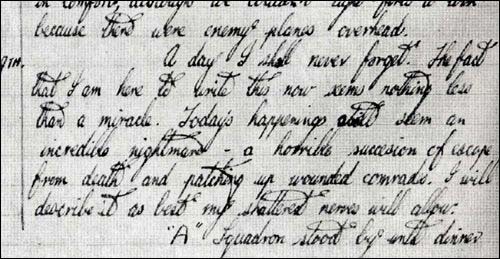 The diaries are being posted 65 years after the events they describe, just as Harry Lamin's letters from the Western Front in the first World War have thrilled a worldwide audience 90 years after they were written. Mayman, now 85, unearthed his forgotten diaries two years ago, while rummaging in the loft of his home in Aughton, West Lancashire, UK. He thought no-one would be interested in them but gave them to his two daughters, Merron Mitchell and Joy Murphy, to look at. "As soon as I started to read them, I was enthralled," Joy told Gemma Jaleel, a feature writer of a local newspaper, the Ormskirk Advertiser. "My dad was only 19 when he started to keep a diary of his war experiences. Every day he would make an entry, however difficult it was. Sometimes he would be writing under a tank after days fighting, always with a fountain pen(*) and whenever he could with illustrations." "Given the high mortality rate of his regiment, I think it was a way of trying to leave something behind in case of his death. Fortunately he survived, as did the diaries." Mayman left school at the age of 15, and began work as a wages clerk for Rycroft and Hartley Ltd, a local textiles company. 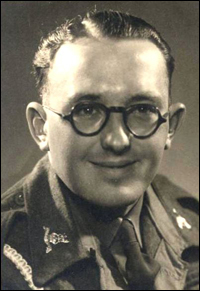 He then found a better-paying job in a Royal Ordnance Factory which manufactured aircraft shells in nearby Steeton. He met his future wife Dorothy at the Methodist Youth Club when they were both 17. Two years later, on Sept. 3, 1942, he was conscripted into the Army. Doug and Dorothy married on April 23, 1945. They have four grandchildren and five great-grandchildren. These days, at 85, Doug describes himself as "a retired finance director - very much EX financial consultant. All jobs too big. Available for social occasions." Private William Jackman was a servant to Captain Morrison who was a multi-millionaire. Morrison arranged for hampers of food from Fortnum and Mason's to be delivered to the trenches regularly and for a bottle of 1900 port from Berry's to be sent out every three days plus cases of whisky and brandy. These were in boxes marked Red Cross. By the time Jackman's Battalion went to the Somme, Captain Morrison had left but he never cancelled the order and the stuff kept on coming. Private William wrote in his diary: "It used to arrive in batches and sometimes we'd have as many as a dozen boxes arriving from Fortnum and Mason's at the same time. There were boxes of tinned stuff, mostly, like galantine of chicken, soups, puddings, tins of fruit, tins of grouse and pheasant, ham - everything you could think of for the Officers' Mess." Imagine, sitting in a trench with fetid water lapping at your boots and rats scurrying hither and thither and thousands of lice crawling all over your body and shells exploding above your head yet dining out on a tin of grouse washed down with fine port. (*) Doug Mayman wrote all his diaries with an ink-filled fountain pen. Ballpoint pens were unknown until after the war ended. 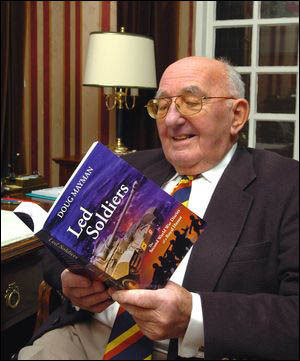 Anyone wanting a copy of Doug Mayman's book should email book.sales@authorsonline.co.uk OR amazon.co.uk OR telephone (UK) 01633 676629. Harry Lamin's book, based on his blog, is complete and has been sent to the publishers, Michael O'Mara Books Ltd. It will go on sale on April 2, 2009 and major booksellers are accepting pre-orders at a discount. You can see letters and a Christmas card Harry sent home in 1917 in this story in the London Daily Mail.